Analytics inform, but the gut is what executives rely upon most when making decisions, according to a new study conducted by the FORTUNE Knowledge Group and gyro. 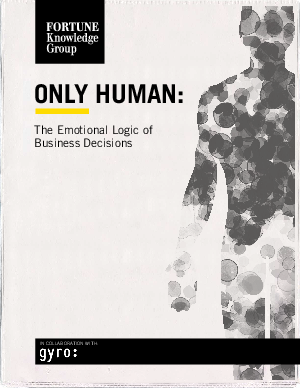 While conventional wisdom would indicate that “hard” elements, such as details around cost, quality and efficiency, are more compelling to decision-makers, this new research suggests that the opposite is true. When asked to share their feelings about what really drives their purchase decisions, senior executives revealed that “soft” factors, including company culture, reputation and level of trust, were what they primarily relied on to help them make decisions. • See the “soft” factors that make all the difference to buyers. • Learn three key steps to relating to buyers on an emotional level.